Offers are subject to change, see dealer for complete details. *All offers are with approved credit. Does not include $199 administrative fee. Security deposit waived with approved credit. Offers cannot be combined and is subject to availability. Down payment may be required. 3.9% APR financing for 60 months. 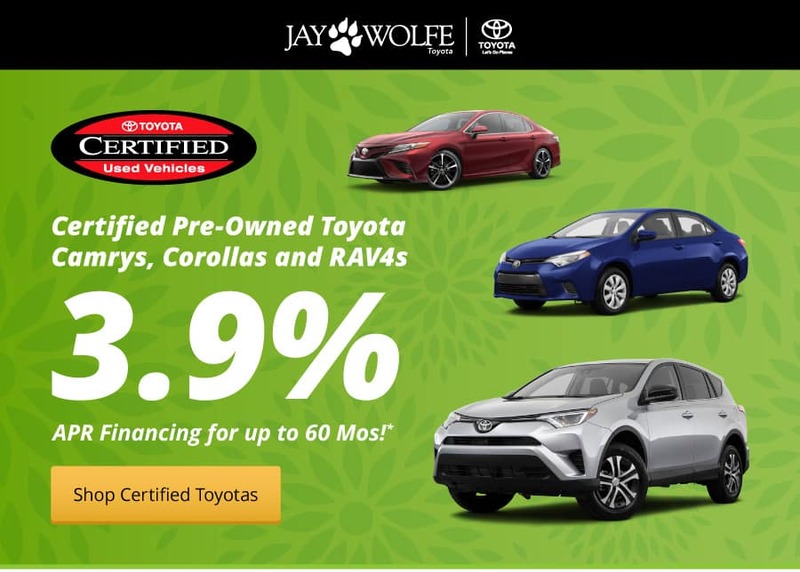 Annual Percentage Rate available to buyers with approved Tier 1+ through Tier 1 (excellent) credit through Toyota Financial Services. College Grad and Military Rebates are not included. Applicable rebates provided by TFS. Offers end 04/30/2019. **All offers are with approved credit. Does not include $199 administrative fee. Security deposit waived with approved credit. Offers cannot be combined and is subject to availability. All-New 2019 RAV4 LE FWD [Stock# T190670] Starting from $25,938. MSRP is $27,185. All-New 2019 Camry SE FWD [Stock# T190480] Starting from $24,110. MSRP is $26,754. All-New 2019 Yaris LE Automatic Sedan [Stock# T190107] Starting from $16,095. MSRP is $18,470. All-New 2019 Avalon Touring FWD [Stock# T190003] Up to $6,088 off MSRP. MSRP is $45,361. All-New 2019 Sienna Limited Premium FWD [Stock# T190308] Up to $6,130 off MSRP. MSRP is $48,814. Does not include taxes, license, title fees, insurance. Includes Destination, Gas and Advertising. Customer is responsible for maintenance, excess wear and tear and $0.15 per mile over 12,000 miles per year. All discounts after applicable rebates. Offers end 04/30/2019.